Fitting in is always a struggle in school, but even more so in our American melting pot. As each new generation of immigrants moves into the mainstream, we all must learn to accept one another by seeing how alike we are in reality. Nothing is as successful at that as a middle school story with class elections, clicks, and recess taunts. Aliya is a fifth grade Muslim girl struggling to find enough courage to talk to the boy she likes. 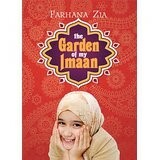 At the same time, she struggles with how much of her Muslim identity she wants to portray at school. But combining the assignments given by her classroom teacher and her Sunday school teacher with the help of parents and grandmother, she comes out of her shell and begins to shine. One of her projects is writing letters to Allah, in much the same tradition as Margaret wrote letters to God decades ago. It is a technique allowing the author to show the inner thoughts of the main character, as well as giving the reader a chance to notice inner growth over time. Writing unsent letters is much the same as writing a diary. To Aliya, the hang-up for her classmates seems to be the hijab, the traditional head scarf worn by Muslim women to show modesty. But when a new student, Marwa moves in and wears her hijab proudly instead of with shame, other students respect her. As she says, “what is in my head is more important that what is on top of it.” The introduction of Marwa is a bit contrived and seems “too” coincidental to a writer, but will seem just perfect to a fourth or fifth grade reader. This book can help overcome misunderstandings between people unfamiliar with the Muslim faith. Students outside the Muslim faith might begin to understand how much they have in common with their new friends. Students inside the Muslim faith will find comfort in this story, as they see they are not alone. The inclusion of a Korean friend, Winnie, who is also from a part Jewish family, adds distinction and color to the fabric of the story. When their school project takes on the backgrounds, cultures, and religions of all the students, the stigma is removed from any one students. Librarians, teachers and parents would do well to include this contemporary story of growing up in an American school in their collections. Especially now, when so many people have become afraid of a whole group of people, that clearly has as many good and bad apples as any other ethnic or religious group. Core Curriculum standards in literature and geography can be met using this book. It would also make an excellent book club choice for grades 4, 5 or 6 for opening discussions about today’s world.